Increase control and implement privacy solutions on AWS. Moving production workloads to AWS can enable organizations to improve agility, scalability, innovation, and cost savings — while maintaining a secure environment. AWS Marketplace offer security industry-leading products that are equivalent, identical to, or integrate with existing controls in your on-premises environments. These products complement the existing AWS services to enable you to deploy a comprehensive security architecture and a more seamless experience across your cloud and on-premises environments. Identify asset vulnerabilities and develop an organizational understanding to manage security risks to your systems, assets, and data. Protect your resources with appropiate safewards to ensure delivery of critical infrastructure services. Detect the occurence of security events and understand their potential impact. After an event, respond promptly, recover capabilities or services, and make security improvements based on lessons learned. The use of cloud services by businesses and government agencies has grown rapidly. This move to cloud-based services has required security programs to extend operations beyond the data center and to re-evaluate security architectures, processes and controls to maintain effectiveness and efficiency in their efforts to secure their sensitive business applications, whether on-premise or cloud-based. 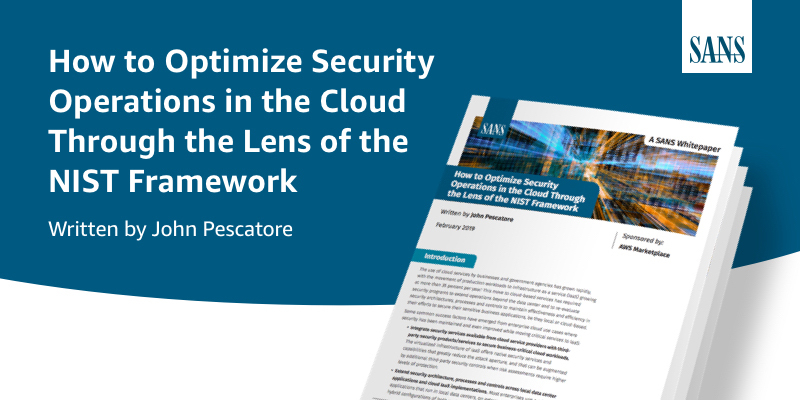 In this whitepaper, SANS Director of Emerging Technologies John Pescatore provides practical scenarios and guidance to help you quickly identify the right use cases to optimize cloud security operations, as well as determine which specific technologies are needed to execute your security mission in the cloud. Help protect your cloud assets with continuous, automated security controls. Gain visibility and insight into your Amazon EC2 instances and containers to protect against threats. Use a VPN to help defend against threats that put customer data and business continuity at risk. Secure sensitive and highly-regulated data by encrypting entire virtual machine instances and attached storage volumes. Do a one-time vulnerability assesment or establish an on-going security management strategy. Improve security posture by identifying threats, vulnerable entry points, and needed actions. Shield web applications from cyber threats that could affect uptime and compromise security. Help protect and secure against zero-day exploits, attacks, and data leakage. Mitigate risks, improve performance, and reduce costs with real-time operational insights. Monitor networks for security threats and deter threats once detected. Help protect data from physical and logical errors, including system failure, application error, or accidental deletion. Use DR technologies to continue operations with as little disruption as possible. AWS Marketplace is a digital software catalog that makes it easy to find, try, buy, deploy, and manage software that runs on AWS. AWS Marketplace has a broad and deep selection of security solutions offered by hundreds of independent software vendors, spanning infrastructure security, logging and monitoring, identity and access control, data protection, and more. These solutions can be integrated with AWS services and other existing technologies, enabling organizations to defend against pervasive threats and strengthen their security posture in the cloud. Accelerate migration to AWS with the ability to easily find, purchase, and deploy matching software available in AWS Marketplace from existing inventory of on-premise applications or alternative products in the same category. Simplify contracting, speed procurement, and get optimal software pricing with pre-reviewed standardized cloud license terms for faster placement, as well as customized pricing and license terms from selected software vendors and consulting partners in AWS Marketplace. Support security management and compliance with the ability to combine private “gold images” with software in AWS Marketplace, as well as create a customized private catalog of pre-approved software to ensure users leverage approved software. Accelerate innovation and time to market with a wide selection of containerized products to enable efficient and repeatable builds, a breadth of ready-to-use machine learning algorithms and models for security analytics.